Kersbrook Guest Accommodation01297 442596work01297 442596fax Guest AccommodationThe Kersbrook is run as a guest accommodation, bed and breakfast business by the Davies family who have owned various Lyme Regis Hotels and holiday accommodation over the last 40 years. 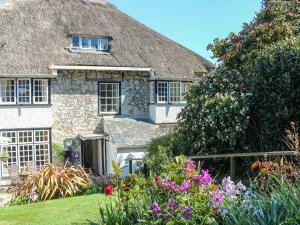 The Kersbrook is a beautiful thatched, eighteenth century Grade II listed building (1780) set in its own picturesque mature gardens just off the town centre with views across Lyme Regis, Lyme Bay, the sea and the heritage coast line. The Kersbrook is run as a guest accommodation, bed and breakfast business by the Davies family who have owned various Lyme Regis Hotels and holiday accommodation over the last 40 years. The Kersbrook is a beautiful thatched, eighteenth century Grade II listed building (1780) set in its own picturesque mature gardens just off the town centre with views across Lyme Regis, Lyme Bay, the sea and the heritage coast line. Features include: 200-300m walk to the town centre or Cobb/ beaches. Private car park on site. Licensed bar. Picturesque private gardens. Grade II period thatched listed building. Facilities for children: Children welcome from any age. From A35 take B3165 signposted Uplyme and Lyme Regis. Go straight across the mini roundabout towards the town, Turn right into Pound Road opposite the Woodmead Road turning, after about 150 yards Kerbrook will be on the right.